The Chichester Wellbeing team is running a new programme of 'Move it and Lose it' workshops to help residents lose weight and feel better. The workshops are part of a safe and healthy programme that is designed to promote weight loss and exercise. The sessions are aimed at people who are overweight with a Body Mass Index (BMI) between 25 and 40. During the workshops clients are encouraged to take a detailed look at their eating habits, health and lifestyle and learn how to make small and simple changes to become healthier. Clients will also have a private weekly weigh-in to help them stay on track. 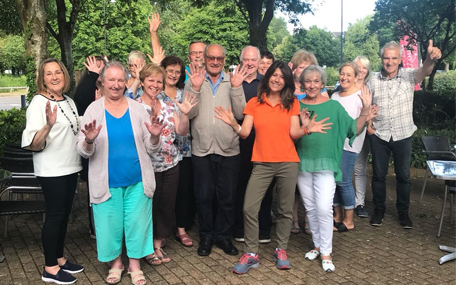 "We all know that we need to exercise to help us lose weight and stay healthy but it can often be difficult to find the time and motivation," says Councillor Eileen Lintill, Cabinet Member for Community Services at Chichester District Council. "Our 'Move it and Lose it workshops include an exercise session to make exercise easy and fun for our clients. "'Move it and Lose it' focuses on healthy eating, nutrition and education about food to help people lose weight and encourages people to make healthy changes to their lifestyle for the long-term. These workshops have been very successful over the years - with one of our current groups having collectively lost nearly 11 stone in seven weeks." Westgate Leisure Centre, Chichester: includes access to the First Steps to Fitness programme. The Grange Leisure Centre, Midhurst: includes an exercise class and nutrition advice. The Selsey Centre: includes an exercise class and nutrition advice. The whole 12-week workshop costs £30, which is to be paid before starting the course. Previous Weight Loss Workshops have been a great success with 80 people regularly attending and the sessions have received positive feedback from participants. "I feel fab. My energy levels have increased, my skin looks radiant, and losing the pounds I can now comfortably fit into my clothes as they were tight before. Thank you for changing my life." Tracey, Chichester. Residents can find out more about Move it and Lose it and book a place by contacting Chichester Wellbeing .